The paintings are part of the Frida Festival (April 5th – April 20th, 2013 at East End Studio Gallery: 708 Ste C Telephone Rd, Houston, TX 77023) which celebrates the life of Frida Kahlo. The event showcases paintings, poetry and is filled with various activities such as Frida look-alike contest and Frida themed market. This is a great way to celebrate Frida Kahlo, a respected visual artist, as well as to unite the community through the arts. Art Exhibition Opening April 5, 2013. Galerie B. Haasner participates in Karlsluhe (Germany) International Art Fair and features and represents my art work, from March 7 – 10, 2013. The Karlsluhe Art Fair features International galleries showcasing classic, modern and contemporary art. You can find Galerie B. Haasner at Hall 3, Stand K22. 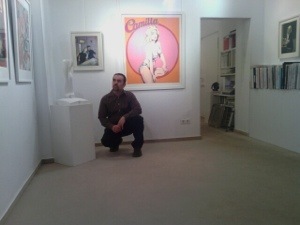 getting ready for a two-person exhibition with the great Mel Ramos in our exhibition space in Wiesbaden, Germany, Galerie B. Haasner… show runs from March 22 through April 27, 2013. If you are in the Rhine River region, check it out… the reception is on Friday, March 22nd in the evening…. fun times! !